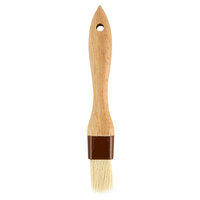 This 1" boar bristle pastry brush is a great addition to any kitchen producing pastries or basting meats. This beautiful, wooden-handled pastry / basting brush can be used for coating fluffy, fresh baked pastries with butter, egg wash, or water. You can also use it to baste meats over a grill. The gleaming lacquered hardwood handle and brown nylon ferrules give your kitchen a professional and high quality feeling, while the boar bristles are durable, water resistant, and snugly secure. This 1 inch boar bristle brush works well for spreading oil on chicken or fish. The bristles are very fine and being that they're made from boar they won't soak up the oil. Great little brush. The wood handle feels high quality and is super smooth and easy to hold and so far none of the bristles have fallen out. This 1" boar bristle pastry brush is indeed a very useful tool in my kitchen. I usually use it for brushing my pastries with egg wash, or oil. but you can also brush your meet with marinades or bbq sauce. The boar Bristles are resistant and won't fall into your pastry. The hardwood handle is firm and easy to hold even when its wet Its definitely feels like a good value product. great size, looks durable and ergonomic. I'm looking forward to using this product to brush egg onto challah before it's sprinkled with several different seeds and is baked. Way cheaper than my local store and same good quality. I don't feel like the bristles are going to fall out and the handle is easy to hold. Nice sized handle and the boar bristle transfers liquid very well, great for basting and for simple syruping cakes! Watch out for the bristles sneaking out of the brush on occasion though! This cheap but nice pastry brush has soft bristles which makes dusting excessive flour on my pastry dough easy. It's easy to clean as well. So, I’ve been trying to learn how to make my own croissants at home. I made the mistake of trying to use a nylon brush to wipe off my excess flour. I realized in the video tutorials, everyone was using a stiff boar bristle, so I knew I had to get one. You can’t beat this price. Impressed with this brush, especially given it's price! Much better than silicone or the other cheap ones out there. A heavy wood with quality bristles. I like this 1 1/2" Boar Bristle Pastry Brush. It was a great value for my money, and I would definitely recommend this product to anyone in need of a pastry brush. I love using these pastry brushes to rub egg washes on dough or butter on bread after it's been baked. It holds a lot and spreads it evenly. This is a great all purpose pastry brush. I like to use it to prep my cake pans. I really like the plastic ring that holds the bristles rather than the metal ones that rust. I purchased the 1 1/2" Boar Bristle Pastry Brush to butter my biscuits. My husband needed a brush for painting so I never had the chance to use it. I must admit, it worked great for painting. The price is very reasonable so I can order another and keep it in the kitchen. Fantastic brush for egg washing puff pastry or even brushing on melted butter. The narrower width allows more precise application. Be careful during the first use. Mine lost a few of the bristles. Since then I have had no problems. This brush is very versatile. You can use it to coat egg whites on pastries, add butter or oil to the bottoms of a muffin tray, and more. Great value brush. It does the job. Only complain would be the brown plastic holder get lose easy. But what would you expect for a couple dollar brush. I thought when I started this that I'd have no reason to care about this thing, but I've fell in love. Its such a tiny simple thing, but it works beautifully! We generally use a big silicon brush, which has dented bread and really never holds much liquid. This one is far different! It's wonderful! We'll be buying a few with the next order and forever. Good size for glazing baked goods and bread. Very easy to clean and brush is soft enough for bread dough. The hair does not come off at all. I gave these only 4 stars. I have had a few of these for over a year now. Use it quiet regularly. I have noticed a bristle here or there. But not enough to not purchase again. They apply my butter, glaze, etc very evenly & with ease. They are durable. Especially when it comes to cleaning up. This 1 1/2" boar bristle brush is great for the biscuits we make. It puts the butter glistening topping perfectly spread on the top of our biscuit! I like these brushes because the are a nice size for egg washing pies and they are easy to clean. I would buy again. You have to be careful when using the product, at least for the first few times. I found that some of the bristles fell out while I was using it and I had to look carefully as the bristle color does not stand out very well. This inexpensive but nice pastry brush has soft bristles which makes spreading egg wash so simple. It's easy to clean as well. Over all a great deal. This is a nice smaller bristle pastry brush. This is great for spreading butter on pastry biscuits or toast. with the handle being real wood it adds a nice touch to it. This size brush - 1.5" - is just the right size for multi purpose use. From brushing the tops of pie crusts with egg wash, to dabbing garlic oil onto foccacia bread, this is a great brush . I have not noticed any bristles falling out during use. The handle feels nice and it is a good length for handling and storage. This pasty brush is okay. Not the highest quality but it feels solid enough and works well enough. Fair for the price I suppose. If you're going to be doing a lot of baking and pastries you may want to skip this one and go for a higher quality brush. I really like this pastry brush. I use it for a lot of different things but what I mainly use it for is to brush powdered sugar off of my fondant. It really makes a big difference when you're working with a lot of funding and you need to get the powdered sugar off. I highly recommend having one of these tools in your arsenal. I had another version of this before, but got tired of the shedding bristles, and decided it was time for a new one. So far, this works beautifully, and no shedding! No issues for 6 months of use. I have yet to see any Brissels come off. This is a good brush for baking and other applications. I love this one. First they are cheaper than the other stores, and really a great quality piece. i ordered a lot to donate them in my school since we are using them too often and the old ones needed to be replace. i bought this brush for the butter. easy to clean and would be use a long time. the price is reasonable and the color is pretty. Basic Pastry brush for a good price that gets the job done. I have used this to brush on egg whites, butter, and even melted chocolate. Pastry brushes are something we need and this brush is decent. It does what it is supposed to do and is not expensive at all. A basic pastry brush, every kitchen should have one. Makes applying egg washes to pies and pastries easy. It does shed sometimes so make sure to keep an eye out when using. Best to clean immediately for sanitary reasons, don't want eggs or food particles sitting in the brush. Make sure to wash and dry the pastry brush before usage. When the brush first arrived, a few bristles were loose and had to break it in by brushing vigorously until all the loose bristle came off. The first few times using this I was extremely satisfied. I only use it occasionally but some of the bristles are already coming off onto the product. Can't have that! The wooden part and the bristles seem to be high quality. The plastic piece around looks like cheap. It would image that the plastic piece will break easily but it's been in use for several days and so far so good. This brush is a good size for brushing butter on breads and rolls after you bake them. Pretty easy clean up with soap and water I hand wash mine and air dry them. Very quality stiff bristles with great construction and sanitary connection to wood handle. I would buy again in different sizes to add to our kitchen equipment. These are well made brushes that do a good job for what they are made for. I would not recommend them for heat applications or for very hard to clean things. This is a nice brush. It works well for brushing the tops of our buns with butter. We like that it is economical as well. The 1 1/2" Boar Bristle Pastry Brush is really easy to hand wash with soap and water after each use. Make sure you do not let it sit but hand wash right away to make the wash easier before the food or liquid gets hard on the brush. Dry the wood well and let the bristles air dry. This little brush has been great for brushing butter on my dinner rolls. The only thing I don't like about it is that it takes a long time to dry. Love the natural fibers of this brush, works so much better than plastic, but make sure not to leave it soaking all day long in a liquid. That will weaken it and the bristle may start falling out. This brush is awesome for egg washing items for baking and applying glazes to finished products. It is easy to clean which is an added plus! This is a good pastry brush. I haven't had any problems with the bristles falling out, which I appreciate a lot. it's always annoying to find hairs stucked in your baked goods. These brushes are sturdy and built well, however, the bristles seem to come out easily when working with sugars and syrups. When I use them for egg wash or dry dusting they are fine, but the thicker syrups pull the bristles out. Hubby loves this brush for marinating chicken on the grill. He uses it all the time and it cleans really easily as well. Great product! This 1.5 brush is great for working with dough or meat s in the kitchen. The bristle is firm and really well placed in the handle. It’s easy to clean under hot water and last for a long time. They are great for glazing, giving egg wash or just brushing off flour. This brush is awesome. Bought a couple for home use and right out of the packaging, I gave the bristles a nice hard yank to see if there were any loose hairs. To my surprise everything stayed in place, and as an added bonus the bristles are incredibly soft. I love this brush. I have used it for all kinds of things from oil, brushing cakes, marinades and sauces. I would buy more for sure. It is a good basting brush. I have used it for few months and haven't had any problems with it. I mostly use this brush to grease the pans pre cooking and baking. In the first few uses few of the bristles came off. However, it is not falling off anymore and i am happy with it. Cleaning is not difficult either. Not sure if it is dishwasher proof. This is a nice, versatile little brush. I've used it to brush egg wash on pastries and butter on pie. I have not had any bristles come out. Another reviewer said to wash it well before your first use to get any loose bristles out - something I would also recommend. This brush did not meet our needs. It looses hairs frequently onto our fondant cakes into egg washes. We have since stopped using this brand altogether. This little brush is a kitchen necessity! We use these to grease our pans, egg wash, glaze and dust flour off pastries before baking- very versatile! Great item. Well made. Much better than ones I have bought in the past. Bristles do not fall out. I have 2 of them. One for oils and butter. The other one i use for basting. Good quality brush for the price, perfect size on brushing pans with butter. Unlike other cheap brush, these seems to have the bristles in tact, hopefully this will last a long time. This brush has a good quality and size. Easy to clean as well. We've used lots and lots of time and they've held very well. A definite good buy from webrestaurant.com. A wonderful brush, bristles don't fall out, nothing cakes into it. A pastry brush that should be in every single kitchen for any reason. Butter and schmears are two good ones. The price is definitely right on these. They hold up very well. I haven't had any bristles in food like with others. Definitely buy again. Good value. This brush is excellent for applying royal icing to cookies and as well as butter to other baked goods. For example, I use this to brush butter onto my scones before baking them. A great all around pastry brush. A must have for every kitchen it's great for basting and spreading melted butter on pastry and bread too. This is an awesome brittle brush. You can Use it from brushing on egg wash on puff pastry to BBQ sauce in a barbecue event. I love this brush! Its great for gently taking excess flour off of dough and brushing down the sides of the pot when cooking caramel. Can't beat it for brushing on bbq sauce. Get more than one! You definitely need this boar bristle pastry brush in your kitchen. Whether you're using it for egg wash on pie dough or basting ribs it's great! I never put it in the dishwasher though, cleans well in the sink! This is a good quality brush. The bristles have not fallen out, like many lesser quality brushes do. And there is nothing to rust, so no worries there. Since the bristle stiffness is perfect, I can use this to brush excess flour from delicate pastries, or to egg wash breads. Would definitely buy again. Very happy to have a pastry brush that can be washed easily. There's nothing worse than finding residue in the bristles and I haven't found that with this one. This is a good quality pastry brush. The bristles are softer than I expected. With the first use, no bristles were loose while applying the egg wash. This is a great pastry brush. The bristles are soft enough not to damage more delicate applications, and firm enough to work with tougher foods and thicker sauces. Wide enough for big jobs, can be fine enough for working in smaller areas. It's great for spreading butter and the brush cleans up well too. What a great brush! Use it to put shortening on my baking pan, for adding sauce to barbecue items and for adding butter to buns or rolls. Nice solid feel. This is the first brush of this type I was able to use by hand and get all the shortening out of. Left no greasy residue behind what-so-ever. Must add...love that there is nothing to rust on this brush. Others I have had tend to rust quickly. Well made pastry brush. The bristles don't fall out as some others do. I've hand washed & placed in dishwasher & so far they have held up great! Great brush. Most brushes I have found don't last long. The bristles get ugly after the first use. Cleaning them is hard as they tend to retain flavors from previous foods. Then I throw them out feeling like I wasted money. Not with these. I love this brush. The bristles have stayed nice use after use. I've been able to clean them properly. I don't smell or feel residue left from previous uses like I did with the other lower quality brushes no matter how many times they were washed. These are perfect for my needs. Will buy more in the future. As another reviewer mentioned this is a great little pastry brush but the bristles can be a bit abrasive for more delicate operations but otherwise a welcome addition to my arsenal. This is a great brush for getting rid of excess flour on pie dough. Works well for brushing an egg wash on bread before baking for the perfect crust. What a perfect pastry brush. I love using this to brush butter on the top of an unbaked pie crust in order to achieve a really nice browning on the crust. I love using this brush to dust off cakes! it works GREAT! The brush seems to be durable its holding up well! I'll be buying more of these soon! An affordable alternative for any BBQ lover! Nice boar bristles make basting meats a breeze! You can also "paint" a sauce attractively with this brush!!! Very high quality. Works well without shedding bristles. Prefer this to silicone or plastic brushes. Does the job perfectly. Great variety of sizes to choose from. I've been looking for a pastry brush that wasn't silicone and this one is perfect! I use it for pastry and it doesn't mark up my dough. These are deffinetly a decent pastry brush. I use them for brushing milk or egg wash on my breads and pastrys. After a while the bristles start to come out though. What a difference a natural bristle brush makes when applying egg wash! For some reason I had gotten used to reaching for a silicone one, where you end up racing to get the egg on the dough before it drops. With the natural bristles you can take your time, (I think they share similar polarity) the brush will hold a lot or a little egg and you won't have those strands of egg hanging off. I also use this to clean delicate mushrooms - it works beautifully without damaging the shroom. And afterward this brush is easy to clean. This works just as great like any other kind of pastry brush. but for the price, wooh! i am sold by this product. i know where to buy it when i need it again. We use these at our bakery for applying glazes and what not to goods. I would definitely recommend washing and pulling on the bristles before the first use to be sure none of them end up on your food. I love this. Excellent for putting egg wash on baked foods like meat pies, sausage rolls and apple pies. I really like them as they are better than some I've bought in the past. This is an excellent pastry brush. I have two of them. One that i use for making my garlic bread, and one that i use for brushing barbecue items and other saucy items. cleans up well and easily and has held up to over a years worth of use and still has a year left in it. I use these for BBQ basting as well as baking. Sometimes the bristles come out. For the price these are a good buy. Over time the bristles stop coming out. This is a convenient size brush to use for egg washing rolls or for applying glaze to large tarts. The quality of the brush is good. This is a handy little brush to have around the kitchen. It worked well for brushing the tops of eclairs and creme puffs, but the bristles are a little too coarse and stiff for delicate baked goods.